If you drive by Bovaird and Airport intersection you will see just another commercial plaza, surrounded by new housing. Back in 1996 I noticed the property was unoccupied and city by law proposal signs had been posted. It would only be a matter of time before the land would be redeveloped. Darren and I made several trips to the property looking for evidence of a bottle dump. The building were not that old and there was a lot of modern garbage all over the neglected property. There was especially a lot of rubbish strung along the edge of a low laying watery cedar lot. We found plenty of 1930's and 40's clear "Crown Imperial" fruit jars as well as the clear "Improved Gem" and "Improved Corona" jars. 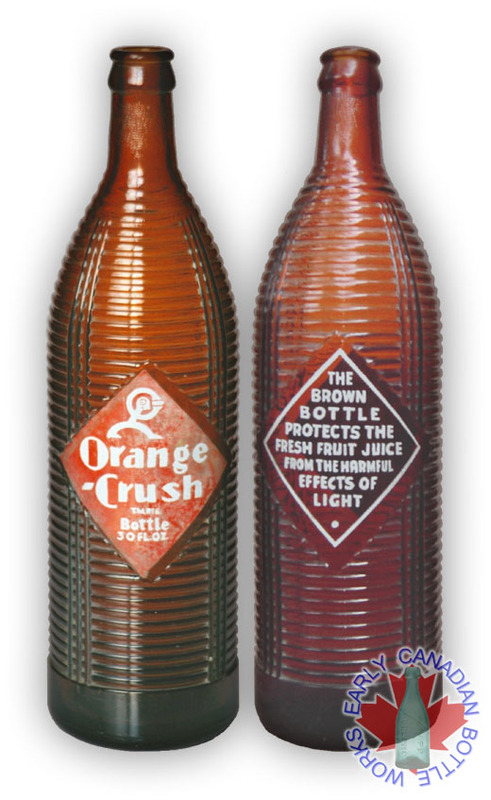 Our collecting habits include all bottles found up too the age of 1970. With no signs of pontilled glass most diggers would have soon moved on. We just kept lifting up every sheet metal, board, car part, appliance, etc on the property. Darren added the following ACL soda's to his collection: Wilson, Patio, Crush, Pepsi, amber Canada Dry Ginger Beer. I added "Canada Dry Low Calorie Beverage" 10Fl OZ Toronto, "Pepsi Cola" 10 Fl OZ among others that went into my many cardboard doubles boxes. In this same location was mounds of cow bones mixed with soil and rubbish. We kept digging through this stuff because of the odd broken milk bottle top. We never did find any, accept for the small blank creamers. In this cow bone dump we found ACL pops from the 50's and 60's, which most have been replaced with better variations in my collection because the acidic ground took its toll on the labels. I will now tell you why I write about this place. In that mound of cow bones I uncovered a mostly buried metal drum laying on its side and the vein of pop bottles that I was finding had spilled out of it. I had enough of the drum exposed, but needed the assistance of Darren to pull it up and loose so I could roll out the remainder of its contents. The memory still plays in slow motion as Darren and I rocked the drum from side to side. Out of the grey ash that poured fourth was a 30 FL OZ amber Orange Crush. I still consider this bottle in my top 5 best finds. The ash had preserved both sides of the ACL. The old "Canadian Bottle Stoneware Collector" magazine rated this bottle as one of Canada's finest pop bottles (issue # 16 1996 pg 46.) Looking through the remainder of the contents I found a "Canada Dry Tonic Water" ACL 6 FL OZ Toronto. So if you are doing business at Bovaird's Shopper's Drug Mart, stop and imagine a swampy wood lot of rich smelling cedars were I rescued a bottle hidden away in a crude but effective time capsule.